The Floating Safe came about during the decade from the sinking of the Titanic and during WWI with the sinking of Lusitania. 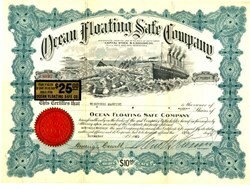 The floating safe was to keep valuables afloat in the event the ship sank. INVENTOR NEAR DEATH IN TESTING SEA SAFE; Supposedly Waterlight Invention Leaks When He Is Thrown Overboard in It. BALTIMORE, Oct. 30.--Twelve thousand persons here today cheered as Menotti Nanni, Chicago inventor of a non-sinkable safe designed for use aboard ships, arose from the bottom of the harbor at Jones's Falls after himself to be placed in his invention and thrown overboard. Whistles tooted and the whole waterfront seemed aroused, for to the casual spectator, 200 feet away from the scene of the demonstration, everything tad apparently turned out w ell. But those aboard the scow from which the inventor was dropped overboard saw a different scene. They saw Nanni go into the teEl cylinder smiling, confident and waving his Sand to those about him. They saw him kiss his wife goodbye and sa.w. her wait stoically while her husband remained under water. Five minutes :,' when Nanni came from the bottom of the harbor, 'they saw him ', taken from the cylinder in a state of exi:, with nearly . two feet of water surrounding him in his temporary prison, and knew that had he remained under water a Pew moments longer he would have perished. The descent today was the third he I made, the other two being entirely successful. The safe used was a new one and not that which he had prey iously used. It was about five feet in diameter and ten feet tall, built in the form of a cy linder wh_eh enclosed a smaller cylin- '~ der. 1s it was lowered into the water the small cylinder was released and shot to tl.~ surface amid great commotion, caused by a chemical compound I used in the safe. When the safe was taken up, for several minutes after the door 'had been opened the cylinder was suspended in midair by a derrick and whirled around, to give air to Nanni, who.sat in a huddled heap. His wife became hysterical.